Kidliterati: Spy On History: The Blog Tour! 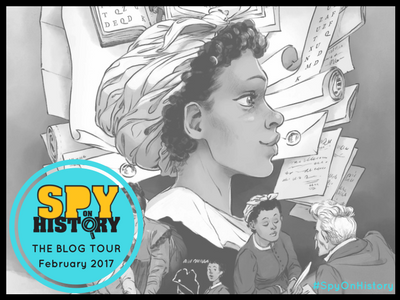 Spy On History: The Blog Tour! You guys... I'm so excited to share this post! It's no surprise (and you can/are encouraged to spy on my previous posts) that I'm a huge Workman Publishing fan. I've found, and they're known for, their inspiring, motivating, sometimes quirky (we love quirky! ), educational, and innovative books. All things this author-book loving-homeschooling mom 100% digs! 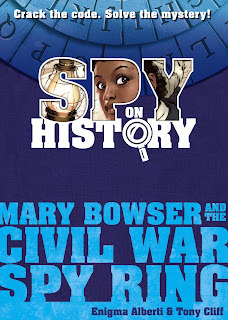 So when I was asked if Kidliterati would participate in the SPY ON HISTORY blog tour, I jumped at the chance. My 10-year-old daughter, Sierra, and I have so enjoyed adventuring along with Mary through her story and working to crack her codes with the super cool spy supplies provided in the sealed envelope at the start of the book (we haven't gotten to the top secret envelope at the end of the book yet, but we're working diligently to earn opening it!). In fact, we're so into it, our spy skills have been on extra high alert... Every other page we'll catch something that could be a clue... No spoilers here, but we're having a blast! Also, I'm loving introducing my daughter to Mary's strength, wit, and bravery as an African American woman (and former slave) spying on the Confederacy during the Civil War and getting to highlight this story during Black History Month. For the blog tour I was asked to answer this question (::🔍Spy Clue:: Super, sneaky sleuth I am, I talked someone else into answering it! ): If you could go back to anytime or place in history, where would you put your spy skills to use? Sierra: "I'd go back and spy during the Revolutionary War." When asked why, she answered, "Because, duh, I'm obsessed with Alexander Hamilton." Enter below for a chance to win 3 super awesome Workman books! This sounds like a fun book! I have to read this and know I would have devoured this as a kid who read every Nancy Drew I could find. A fun, interesting trio of books! Thank you for the contest! The books all look great - I admit, that Boss Babes looks so cool! !